We're back to publishing "Lovin' Lilburn", our newsletter. If you received it in the past, please check your spam and update your email accordingly. Or you can sign up by clicking on the email address to the right and providing the email address you would like to use. The Lilburn Community Partnership is a grass roots effort to create and sustain a safe, vibrant, and prosperous Lilburn community. Great communities don’t just happen--they take time and effort from the many entities that make up the community: businesses, neighborhoods, schools, arts and athletic associations, civic and faith organizations, and visitors all working together to do their part to make Lilburn a great place to call home. Take time to tour our website and whether you are a business owner, a resident or a visitor, we are glad you visited and invite you to explore our town and get to know us. The Wynne-Russell House, the second oldest structure in Gwinnett County, is open to the public on specific dates throughout the year and is also available to rent for small events and meetings. The home, built in 1826, is on the Registry of Historic Places and is a pristine example of “Plantation Plain” architectural style of the upper Piedmont region. The interior floors, walls and fireplaces are original and largely untouched by modern finishing. The site also includes a family cemetery. The home, located at 4685 Wynne-Russell Drive in Lilburn, is owned by the City of Lilburn and managed by the Lilburn Community Partnership. 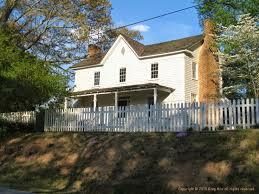 The Wynne-Russell Preservation Committee helps maintain the property and produces events. More information on rental and events can be found at www.lilburnevents.com. Past events have featured free monthly tours featuring an exhibit of 1895 Luxomni and general information tours conducted by local historians. Most recently ghost tours and a paranormal investigation were conducted by Shannon and David Byers of Timeless Paranormal. Shannon and David have worked with PBS American Ghost Towns and their ghost tours pair their paranormal investigations with known history of the families that lived in the Wynne-Russell House. They also give a presentation of the equipment that they use when conducting their investigations. The Lilburn Community Partnership has prepared a booklet on the Wynne-Russell House which includes a history, genealogy and the paranormal investigative reports by the Byers. It is offered for sale and all proceeds benefit the Wynne-Russell House. The Wynne Russell Historic Preservation Committee conducts free tours of the house. Check www.lilburnevents.com or contact info.wrhouse@gmail.com for tour and event information. LCP does not share or sell its newsletter email addresses.